There are times when a patient no longer needs acute inpatient hospital care, yet the patient may not be well or strong enough to return home immediately. For these kinds of patients, Washington County Hospital offers a comforting alternative. 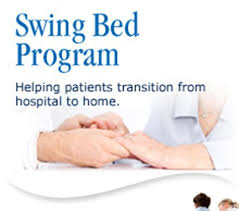 Our Transitional Rehabilitation Program, also known as "swingbed," is designed to provide patients with individualized, in-hospital care and physical rehabilitation to help them reach an optimal level of functioning. This post-acute care is designed for patients who are discharging from acute care, but need temporary additional care that cannot be provided at home or through outpatient care. Through a combination of focused rehabilitative therapies, attentive nursing care and medical supervision, patients gain the strength, functionality, balance and range of motion they need to care for themselves with confidence.